A protocol was developed and evaluated for nonovulating breastfeeding women to determine potential fertility with an electronic hormonal fertility monitor. The amount of required abstinence (i.e., days of potential fertility) through the first menstrual cycle indicated by the fertility monitor was significantly lower (17% of the total days) compared with the amount of abstinence (50% of the total days) indicated by the self-observation of cervical mucus. Accepted version. Fertility and Sterility, Vol. 84, No. 3 (September 2005): 805-807. DOI. © 2005 Elsevier. Used with permission. 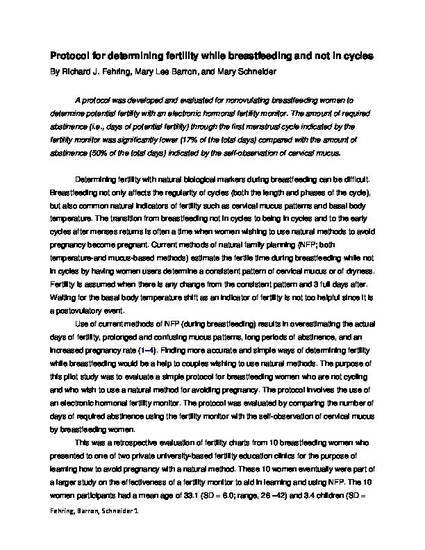 NOTICE: this is the author’s version of a work that was accepted for publication in Fertility and Sterility. Changes resulting from the publishing process, such as peer review, editing, corrections, structural formatting, and other quality control mechanisms may not be reflected in this document. Changes may have been made to this work since it was submitted for publication. A definitive version was subsequently published in Fertility and Sterility, VOL 84, ISSUE 3, (September 2005) DOI.